After 40+ years of marriage, my spouse and I have come to acknowledge that one of us is more of a financial risk taker than the other. Understanding this fact helps us live with each other’s opinions on how and in what we should invest. Here are some suggestions to help you do the same. 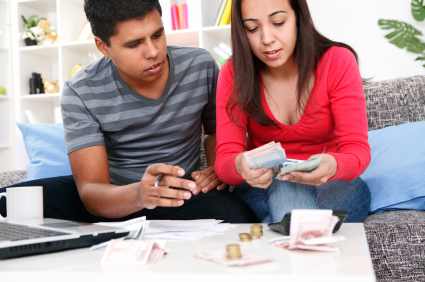 Understand each partner’s money history and experience. You may not even be aware that you each have different perspectives on what risk is or how much to take when you invest. what kind of emotional issues you have with money and what kind of financial education you received. Then tell each other your stories. The book also provides a quiz to help you reflect on your tendencies in the above areas. Know the effect of taking too much risk on yourself and your partner. Taking on debt never has bothered me, because I have always felt that we kept it under control and no matter what, would pay it off. Years into my marriage, I found that for my spouse, it was truly disturbing, stressful and sleep depriving. Taking on a new mortgage is something so abhorrent to him that he absolutely refuses to do it. He pays off his credit card BEFORE the statement comes! Knowing that we have different levels of stress around risk helps us pause and think through what we are doing – so that we don’t cause undue consternation. Maybe you haven’t a clue what your risk tolerance is. Here is a quiz that might help. It was developed by two university personal finance professors one at Virginia Tech and the other at Kansas State University. Remember to consider real numbers. When you have low income, little savings, not much time to accumulate or lots of debt, you probably don’t want to be investing at high risk levels, according to Invesco. In order to meet some financial goals, you must take some level of risk. Nothing in life is certain. However, unless you agree on what your financial goals are as a couple, chances are you won’t get there. Once you agree on goals, and you both understand the need for both safety and risk to reach them, it should be easier for you to agree on investing allocations and strategies. This may be especially true if you divide up the pot and let the risk taker do the risky investments and the more conservative person handle the conservative investments. You probably each have your own retirement accounts. Each person can manage them according to their own tolerance for risk and stage of life. In addition, you could handle the money and investing by splitting the invest-able amount between the two of you, each handling a portion of it. We have done both. I manage my own retirement accounts. He manages the bond investments and I handle the stock, real estate and other investments. Keep track at the household level. In the end, if one spouse invests aggressively while the other is more moderate or conservative, that’s OK, says Dawn Brown, a financial planner in New York City. You just have to look at your entire portfolio to make sure it’s allocated for your long-term goals. Financial planners have negotiated conflicting risk tolerances of spouses in various ways including implementing separate portfolios for each spouse, taking an average or weighted average of each spouse’s tolerance for risk, or simply basing portfolio allocation decisions on the spouse with the lowest risk tolerance. Sometimes just having to organize your thoughts to present to a third party can make it easier to work out differences. How do you and your spouse work out your investing differences and tolerate each other’s risk tolerances? Good article. I found it interesting as I am in the middle of a behavioral finance class right now for my masters program. You touch on some good points here, especially when having to consider another person. How is that class? Is what they teach applicable at the personal finance level? My wife is ultra-conservative, while I’m more open to taking risks. She manages the household finances and I manage both our retirement accounts. Sounds like that works for you guys. Great insight to a tricky topic. Agreed about keeping track! Oops WordPress went nuts. Thanks for the comment and it IS a very tricky topic, one that can cause arguments or worse. Being honest about each other’s weaknesses when it comes to money will really help. It pays to take risk, but it’s also better to ensure that you’re not risking it all, so having separate accounts is one thing every couple should implement when it come to their finances. Well, separate accounts can work, but I wouldn’t go so far as to say that every couple should have them. I believe that each family needs to work through their own solutions.